2017 Topps Triple Threads Baseball sticks closely to the niche the brand has carved out for itself over the years. Centered on autographs and memorabilia cards, the checklist is a big one but there’s also a certain sense of rarity about much of it. Once again, boxes come with two packs. Both have three base cards, a couple of parallels and two hits. 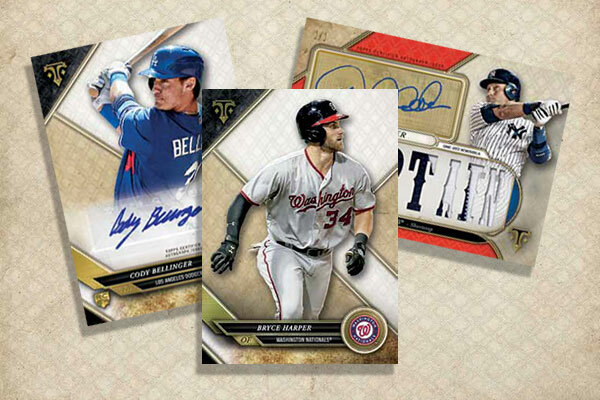 One pack’s premium content consists of an autographed triple relic and a jumbo relic card. The other has either an autographed relic or rookie autograph plus a triple relic. So spread across the box, you get a pair of autographs (many of which have memorabilia) plus a couple of relics. All autographs and memorabilia cards are serial numbered to 99 or less. Virtually all of the 2017 Topps Triple Threads Baseball autographs are accompanied by memorabilia. Triple Threads Autograph Relics come numbered to just 18 copies. These are cards where the windows used to display the swatches are cut out to show words, small phrases or stats used to described the player. 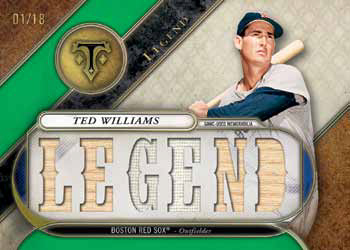 Parallels include Gold (/9), Sapphire (/3), Ruby (1/1), Wood (1/1), and White Whale Printing Plates (1/1). 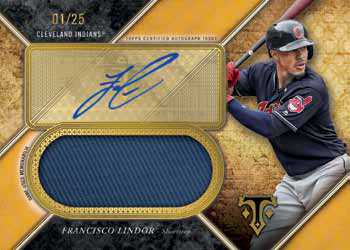 Combining signatures and swatches from three players, Triple Threads Autograph Relic Combo cards return. 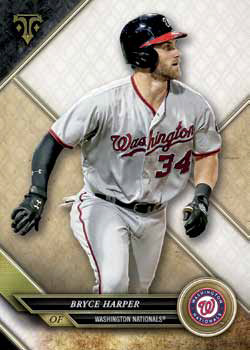 Base versions are numbered to 36 while parallels are available in Silver (/27), Emerald (/18), Gold (/9), Sapphire (/3), Ruby (1/1), Wood (1/1) and White Whale Printing Plates (1/1). Autographed Unity Jumbo Relics come with a larger-than-average piece of memorabilia. Base versions have 99 numbered copies to go along with a handful of parallels: Silver (/75), Emerald (/50), Gold (/25), Sapphire (/10) and Ruby (1/1). While these are already fairly rare as far as numbering goes, 2017 Topps Triple Threads Baseball has several autographed memorabilia inserts that are on the scarce side, especially when you factor in the fact they have only limited parallels. Autograph Deca Relic book cards (/10) pair the signature with ten pieces of memorabilia. Autograph Deca Relic Combo book cards (/10) take those ten memorabilia swatches but they’re all from different players. The signature count jumps from one to ten as well. Both of these have Gold (/5) and Ruby (1/1) parallels. Jumbo Plus Autograph Relic and Letter Plus Autograph Relic book cards (both numbered to 3) use over-sized swatches as their starting point. Letter Plus cards have a nameplate letter for one of those pieces. One-of-one Ruby cards are the only parallels. 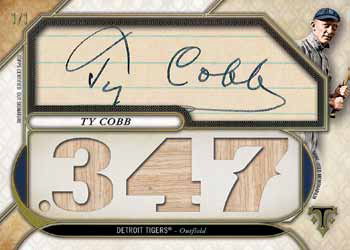 Cut signatures are combined with memorabilia in Cut Above Relics and Dual Cut Above Relics (1/1). 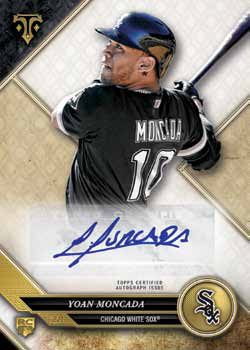 Rookie Autographs are the only signed cards in 2017 Topps Triple Threads Baseball without a relic. Base versions are numbered as are the parallels: Emerald (/50), Gold (/25), Sapphire (/10), Ruby (1/1), and White Whale Printing Plates (1/1). Triple Threads Relics are a staple for the brand. Each embodies the “triple” theme with three swatches or bat pieces. They come in five separate themes, all numbered to 36. Regular Triple Threads relics highlight a current player with a word or stat display window. There are also Legends, Combo versions with three different players, World Baseball Classic Relics, and World Baseball Classic Combo cards. No matter the type of Triple Threads Relic, rarer versions come in Silver (/27), Emerald (/18), Gold (/9), Sapphire (/3) and Ruby (1/1). The one-per-box Unity Jumbo Relics have a fairly sizable swatch, similar to the signed versions. However, the numbering here for individual cards is much lower. Base versions are limited to 36 copies each with Silver (/27), Emerald (/18), Gold (/9), Sapphire (/3) and Ruby (1/1) parallels. Triple Threads All-Star Patches have just nine copies each plus a one-of-one Ruby. Since its debut, part of the intrigue about Triple Threads is the chase for rarer cards. Because the checklist is so big, it allows for more limited items. That doesn’t mean that a cornerstone collection-type card is in every box but it does open up more opportunities than a lot of other products. Of course, there’s a bit of a trade off with the price tag that’s also higher than a lot of other products. 2017 Topps Triple Threads has a variety of book cards offering different combinations of patches and distinct pieces of gear. One-of-ones include Bat Knobs, Jumbo Patch Combo, Bat Nameplates, All-Star Jumbo Patch, All-Star Jumbo Sleeve Patch, All-Star Majestic Logo, All-Star Laundry Tag, and Jumbo Letter/Number Logo book cards. Jumbo Plus Relic and Letter Plus Relic book cards are both numbered to 3 with Ruby (1/1) parallels. Deca Relic Combo book cards (/10) are spread over five panels. These have gear from ten different players. Gold (/5) and Ruby (1/1) are the only parallel versions for these. The main part of the 2017 Topps Triple Threads Baseball checklist is divided up into two sections. First up are the base cards, which card a sort of majestic to them. This is in line with recent years. All of the parallels are numbered starting with seven basic levels: Amethyst, Emerald, Amber, Gold (/99), Onyx (/50), Sapphire (/25) and Ruby (1/1). Base cards also have one-of-one Printing Plates. Beyond the base set are Rookies & Future Phenoms Autograph Relic cards. That said, they’re numbered like inserts. Base versions are numbered to 99 copies and have three swatches to go with the signature. Parallel levels for these are a little more limited: Silver (/75), Emerald (/50), Onyx (/35), Ruby (1/1), Wood (1/1) and one-of-one White Whale Printing Plates.